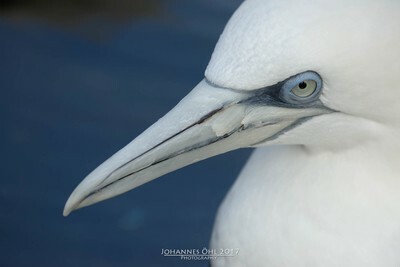 CloseUp of a Northern Gannet, which is a seabird living on both sides of the north Atlantic. Adults become up to 110cm (43in) long an can weight up to 3.6kg (7.9lb) They can have a wingspan of 180cm (71in). In my family it is a tradition to visit at January, 1st the Wilhelma (a botanical garden and zoo) in Stuttgart, Germany. This is one of the photos I have taken there. So it is a zoo-photo, as so many photographers are doing it. It gives a great opportunity to come really close to the animal, that you are able to fulfill the 1st composition rule: fill the frame! In the early morning of January, 1st there are only a few people at the zoo. The most are still lying in bed after having a big Sylvester party. You are mostly alone, nobody is disturbing, if you are working with the photo equipment. This morning it was overcasted, no direct sunshine, which produces a very smooth light, without deep shadows. Perfect for taking close-ups of animals. I used my Nikon D800 camera with AF-S NIKKOR 80–400 MM 1:4,5–5,6G ED VR. This lens allows you to come very close to the animals. It is my favorite lens for shooting animals. I am using no flash. The idea of this photo is to have the beek as a diagonal line and applying the 2/3-rule: The bird is filling 1/3 of the picture, the rest is background. I like it that the eye has the same color as the background. This makes it to the "perfect wallpaper" for my computer (actually it is my wallpaper now). In addition I wanted to show the personality of this interesting bird. I was very often in Wilhelma before, but I haven't shot this bird before. Now it was time to do it. I used DxO-software to reduce the noise and brighten the background-color a little bit. The software is very easy to use and very efficient. It's my favorite software, if you are mostly happy with the picture and just want to polish it a little bit. When I plan a trip to the zoo I take always my Nikon D800 instead of the Sony Alpha 7r II, because I have here lenses with a longer range: AF-S NIKKOR 80–400 MM 1:4,5–5,6G ED VR. For this lens I have also an AF-S TELEKONVERTER TC-14E III, which increases the 400mm to 560mm maximum. This is really enough to fill the frame. Because Wilhelma is also a botanical garden I am using a 20years old Nikon Micro 105mm 2.8, which is my favorite lens. It produces very sharp photos with brilliant colors. Of course it has no VR-feature, but if you are working with a tripod, this is not relevant. For this I use a Gizo-tripod with an ARCA-head. Zoos are the perfect places to improve your photography, because the main-object is always there. In the wild nature you have often only a few trys to get the perfect photo. This photo was intended as a wall paper at my computer. Therefore the photo should not have a lot of colors and it needs big areas with empty space. Otherwise you would not find your icons anymore.